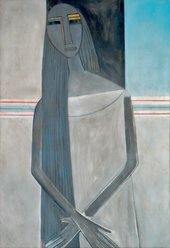 What are the common themes within his early work? How did Cuba impact his work? 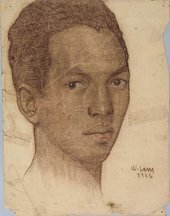 Lam made only a small number of self-portraits throughout his career. 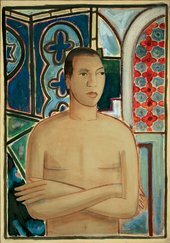 This self-portrait from 1938 signifies his bohemian status as an artist. Shown in the colourful interior of his studio, Lam holds himself purposefully, yet he avoids direct eye-contact with the viewer. He would later go on to present himself in a much more abstract style. 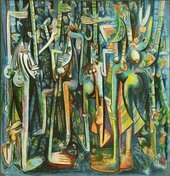 Completed in 1943, The Jungle is considered Lam’s breakthrough piece of art. 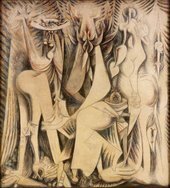 The large scale painting depicts hybrid male and female figures within a crowded Cuban jungle, their bodies merging between human, animal and plant. The faces appear mask-like, while their breasts, buttocks and genitalia are exaggerated and eroticised. 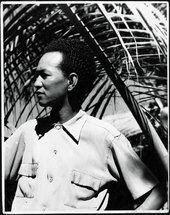 The artist explained that ‘in The Jungle and in other works I have tried to relocate Black cultural objects in terms of their own landscape and in relation to their own world’. Unfortunately, as the work was painted onto large pieces of kraft paper, it is too fragile to travel. Lam considered this work a direct comment on his home country and its corruptions. He later explained that the woman on the left represented ‘the paradise that foreigners seek in Cuba, a land of pleasures and sickly-sweet music’. Others have interpreted the figure as Oshun, the Orisha of love, depicted alongside warrior deities Elegua and Ogun, the Orisha of war. Together they come to represent resistance to the corruption of Cuba by imperialist powers. Alejandro García Caturla was a Cuban composer and judge, who was murdered in 1940 by the defendant in a trial he was to oversee that same afternoon. In 1950, Lam was visited by Art News journalist Geri Trotta and photographer Mark Shaw. Together they documented Lam creating this work, gaining a unique insight into the artist’s practice and home life. Unpublished photographs show that Lam’s initial design for the painting was on a scrap of paper. The artist then applied multiple washes of paint, thinned with turpentine, onto a canvas. The article suggests that Lam found this a torturous process, stating ‘all art is tragedy…for me, painting is a torment’. 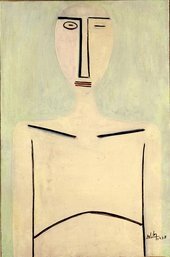 Lam is one of the most fascinating figures in the history of modern painting. Lam has an Oriental facility for design. He composes as naturally as he breathes. We can appreciate how these symbols … are arranged together with such rhythmic skill and clarity, that their rational organisation almost exorcises their terror. 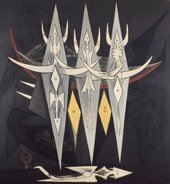 His art is the last tarot of surrealism and a tropical wonder of modern painting. ‘As I work, I do everything intuitively’. 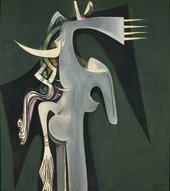 ‘When I arrived in Paris, after the fall of the Spanish Republic to the fascists, I began to paint what I felt most deeply […] this strange world started to flow out of me’. ‘Africa has not only been dispossessed of many of its people, but also of its historical consciousness … I have tried to relocate Black cultural objects in terms of their own landscape and in relation to their own world’. 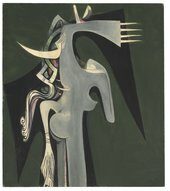 Visit The EY Exhibition: Wifredo Lam at Tate Modern, 14 September 2016 – 8 January 2017.